Hey guys. Well this is something I never thought I'd see again and is the first time I've cried since being diagnosed. Very thankful to be home and Braddach is happy to spend the evening with me. I know I've still got a struggle ahead but I'm ready to keep battling. Thanks for all your prayers and best wishes. It has meant so much and I can't thank you enough. What a great thing Tom! Very happy for you brother! This is a fine moment indeed! Congrats Tom. Enjoy every minute. God bless you man. Wishing you nothing but the best! Rest up, and fight on good sir! We're here for support all the way. Pm me that addy and I'll send you a reward. Admit it the only reason you came home was to loot my baccy bin. I'm new to the forum, but I want to wish you well and hope things keep looking up! Fantastic view from the easy chair indeed! Glad to see the cat has a nice soft spot to sleep. Nothing like being home to help the healing process. Keep your head up and move forward. That picture is worth 2000+ words. Keep on keepin' on! I'm sure the comforts of home and contact with family and friends in a less stressful environment will aid in your continuing recovery. All the best to you. I'm so glad to know you're home again. Thanks for the great news Tom. I can only imagine how good that must feel right now. Keep fighting the good fight brother. Please PM your address when you find time. Thanks so much everyone. It's great to be back home with my two cats, family, and friends. It was pretty hard saying goodbye when I left which makes this homecoming all the sweeter. I start my outpatient regimen tomorrow and will be going to the hospital 3 days a week for injections, transfusions, and blood work. Thanks again. Now that's where you should be Tom. Good to see you home friend. 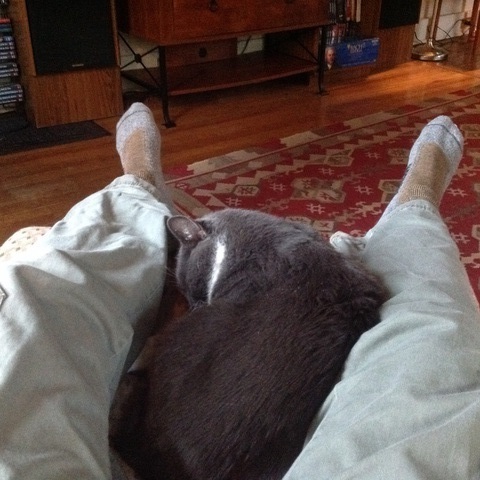 Looks like you've got the right position - feet up, with cat - and make sure you take the time to enjoy it and relax. Great news! There's not much better than getting out of a hospital to go home. Take good care of YOU! Welcome home Tom! Prayers and good karma coming your way. Get your rest and keep your spirits high. Here's to you getting stronger every day!! !